What is a MindSensors NXTSumoEyes sensor used for? What does a MindSensors NXTSumoEyes look like? How is a MindSensors NXTSumoEyes sensor connected to an NXT robot? How can we test a MindSensors NXTSumoEyes using NXT-G? How can we test the MindSensors NXTSumoEyes using RobotC? How can I get my hands on a MindSensors NXTSumoEyes? 1. What is a MindSensors NXTSumoEyes sensor used for? The MindSensors NXTSumoEyes sensor can be used to detect the presence of an object ahead of the sensor. It has two pre-set distance ranges. 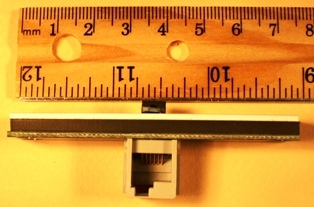 In short-range mode, this sensor can detect objects in approximately 20 degree arcs to the left, centre or right if they are closer than approximately 6 inches (approximately 15 centimetres) from the sensor, as represented in the diagram below. 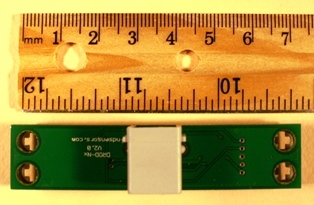 In long-range mode, this sensor can similarly detects objects that are closer than approximately 12 inches (approximately 30 centimetres) from the sensor. However the 15 and 30 cm. ranges noted above should be treated as indicative only, because the distance at which the NXTSumoEyes can detect an object will vary depending on that object's shape, hardness and/or colour. You should always test the sensor to see what distances your can achieve in practice. 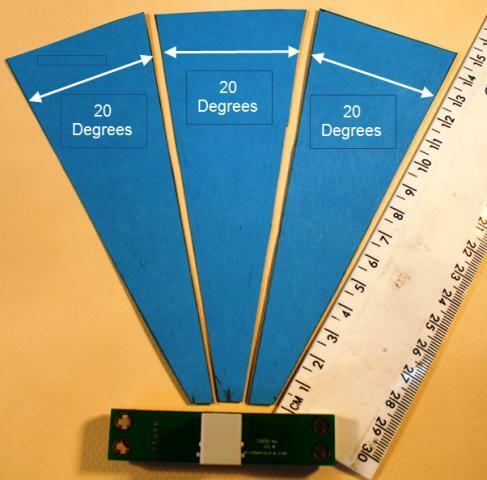 Other sensors that can be used to detect objects at a distance include LEGO's Ultrasonic sensor, and HiTechnic's EOPD sensor, each of which uses a different media to detect distance. The SumoEyes sensor measures the reflection of infra-red light; the ultrasonic sensor measures distance using high-frequency sound waves, and the EOPD sensor uses pulsed light waves - which sensor you use may depend on your application as each will have an advantage in different environments. 2. What does an NXTSumoEyes sensor look like? 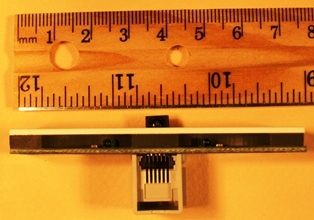 The physical size of the NXTSumoEyes sensor can be judged from the following top view, bottom view, front view and back view. The ruler divisions are in centimetres and inches. A YouTube move, a wmv movie and an mp4 movie with similar information can be seen below (20 seconds); note that some videos can be expanded to a full screen by clicking on or in the lower right-hand corner of the movie screens. 3. How are NXTSumoEyes sensors connected to an NXT Robot? 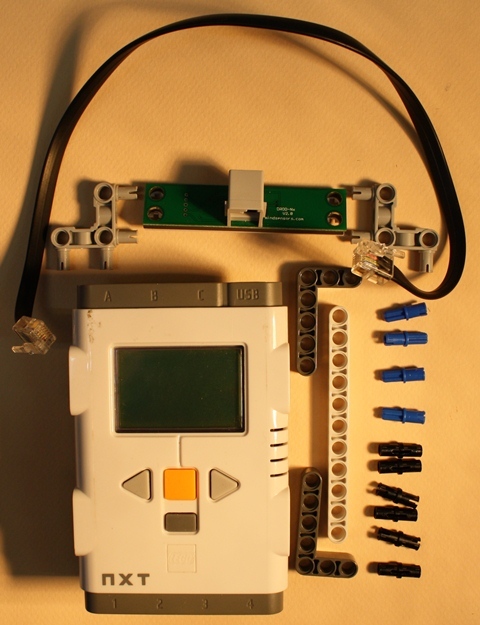 We can connect an NXTSumoEyes to a LEGO NXT MindStorms computer brick using the components shown in the picture below. The process of putting these together is shown in the videos below (2 minutes 35 seconds); note that the videos can expanded to a full screen by clicking on or in the lower right-hand corner of the movie screens. This test rig is now ready for use when testing to see if your NXT SUMO Eyes sensor works as you expect it to work. 4. How can we test NXTSumoEyes sensors using NXT-G? 5. How can we test NXTSumoEyes sensors using RobotC? First we need to download the RobotC library used by the NXT Sumo Eyes sensor. This is located here. We go to this web site, and download SE-lib.c. This is illustrated in the following videos. Note that the videos can expanded to a full screen by clicking on or in the lower right-hand corner of the movie screens. 5.2 Adding the RobotC Library to your RobotC program. The library you have just downloaded in now placed in your RobotC program, just before the "task main()" portion of our RobotC program, as shown below. // obstacle is in front. I have added some code in the main part of the program that takes the response from the NXTSumoEyes sensor and displays it on the NXT robot's screen. 5.3 Testing the NXT Sumo Eyes sensor using RobotC code. The code from section 5.2 is then downloaded to the LEGO NXT MindStorms robot. What happens when a test is run is shown in the videos below. Remember that "L 3" = left of the robot in long range mode, "L 1" is ahead of the robot in long range mode, and "L 2" is to the right of the robot in long range mode; also "S 3" = left of the robot in short range mode, "S 1" is ahead of the robot in short range mode, and "S 2" is to the right of the robot in short range mode. Note that the videos can expanded to a full screen by clicking on or in the lower right-hand corner of the movie screens. 6. How can I get my hands on MindSensors NXTSumoEyes sensors? You can purchase an NXTSumoEyes sensor from Amazon.com by clicking on this image . 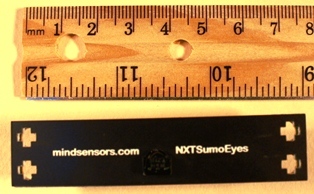 The manufacturer of the NXTSumoEyes sensor is MindSensors. Their web site is http://www.MindSensors.com . For more information, you can go straight to their NXTSumoEyes web page by clicking here.